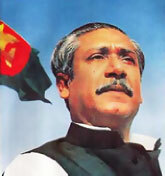 On March 7, 1971, Bangabandhu Sheikh Mujibur Rahman called upon all Bangalees of then East Pakistan (i.e. today's Bangladesh) to launch a decisive struggle against the Pakistani occupation forces indicating for taking all-out preparations for the War of Liberation. 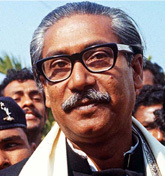 On this day in 1971, Bangabandhu Mujib delivered his historic speech before several hundred thousands of people at the Suhrawardy Udyan (the then Race Course Maidan) in Dhaka. 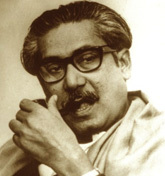 In a thunderous voice, Sheikh Mujib declared 'Ebarer Sangram Amader Muktir Sangram, Ebarer Sangram Swadhinatar Sangram' ("this struggle is for our freedom, this struggle is for our independence"), inspiring people from all walks of life to prepare for the war that the Pakistani regime would inflict upon the unarmed Bangalees 18 days later, committing one of the worst genocides in human history. 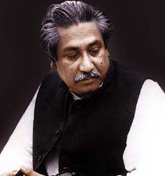 Sheikh Mujibur Rahman returns to Bangladesh. NBC news report from 1/10/1972 on Sheikh Mujibur Rahman's homecoming in independent Bangladesh after spending 10 months in prison in Pakistan. The second part of the interview. Famous British TV personality David Frost took this interview of Sheikh Mujib a few days after his return from the Pakistani Jail. 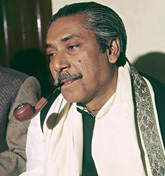 This is the interview where Bangabandhu claimed 3 millions of bengali were butchered by the Pakistani army and he requested the world to come forward and help to try the war criminals and reconstruct the newborn nation.